Today I climbed to the summit of the Dutchmans Stern (no apostrophe, woeful English grammar in my opinion) and activated VK5-NE-028 (six points). I am delighted to report I had 23 contacts. Thanks to all who took time out on AFL Grand Final Day to give me a contact and thanks to those who alerted others. This summit is located within the Dutchmans Stern Conservation Park and also counts for the SANPCPA award (1 point). It took a little over two hours to climb the 4.2K route to the summit and about one hour forty minutes to descend. I was feeling pretty tired by then. I used my new seven metre squid pole and a couple of trees to support my dipole and a 4.3 amp hour sealed lead acid battery for power. My gear is too heavy! I will be working hard to reduce the weight. I am considering Li Po batteries and I have a SOTA linked dipole (which I haven’t tried yet) and continue to use my home made dipole which is so rugged. 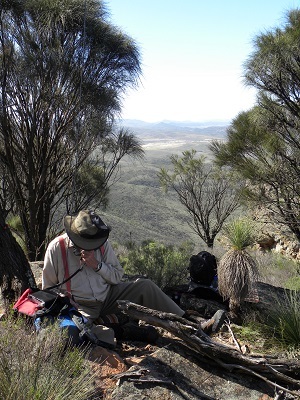 The following contacts were made on 40 metres: VK5CZ, Ian, who was unwell and could not join me in the activation; VK5IS QRP, Ian; VK5HS, Ivan; VK5WG, Nev; VK5NQP, David, who with some encouragement and slow use of phonetics was able to made a successful contact; VK5LA, Andy; VK2YW, John; VK3FPSR, Peter; VK2UH, Andrew; VK3CAT, Tony; VK3ANL, Nick; VK3DET, Ernie; VK5LY, Larry; VK5PAS, Paul; VK5AV; Tim; VK3MCD, Brian; VK3HRA, Allen; VK5PAS, Paul, with the AFL scores; VK5AKH, Andrew; VK5FMID, Brian; VK5HCF QRP, Col; VK5AR/p, Allan portable at Eagle on the Hill and undertaking antenna experiments and VK3YY, Glenn. The Dutchmans Stern Conservation Park is a great place for a hike. It is also very beautiful on the slopes and towards the summit. Unfortunately acres of Salvation Jane, a favourite with the bees, was not good for my lungs. You walk through this to get to the trail. We also noticed plenty of goats, four legged ones. 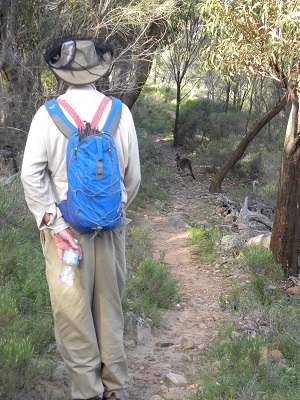 However, the kangaroos were pretty quiet and did not rush away, but stopped and watched us make our way down the path. We saw lots, including plenty of juveniles. I commend to you the Walking Trails Support Group brochure if you are planning a trip. We spoke to a young woman training for her attempt at Mt Killimanjaro who left the car park at the same time as us and took the longer loop track to the top. We caught up with her again on her descent 100 metres from the summit. We also spoke with a couple, about our age, from NSW and a man, a bit younger than me, a Vietnam Vet, keeping fit. Otherwise the Park was ours! We left a note in the visitors’ book kept in a sealed container at the summit. It will tell future readers of the VK5 and SOTA awards.